You know darn well it is not yours. Matt was so generous to transfer that brand to the WordPress Foundation—matter of fact, he had to found it in the first place in order to transfer the WordPress brand to it. Except that this is entirely wrong. I get that the download link next to that logo points to .org. But who else than community insiders would make anything of it? People (including journalists) who are unfamiliar with WordPress history? I also get that some things just “happen”. Like, you were creators of WordPress last year. I get that you may not have phrased that ad yourself. But heck, can you understand all these little instances add up to something? We know that you know that we know … BUT OTHERS DON’T KNOW! 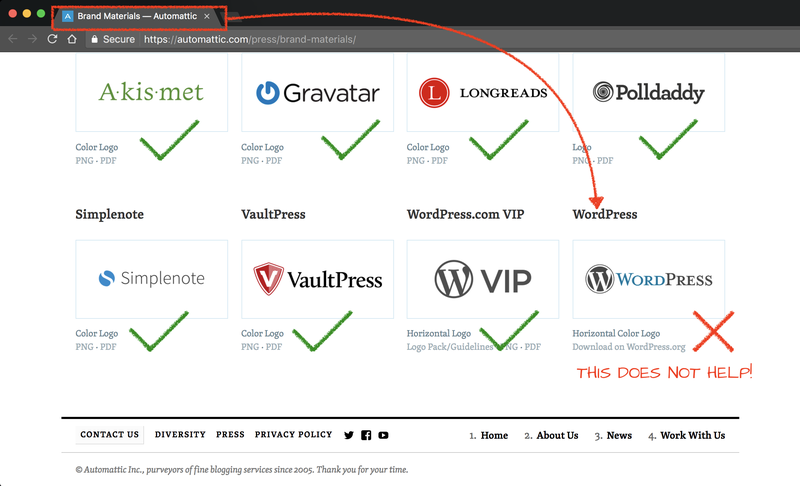 By listing the WordPress brand on your brand page, you put a clear message to the rest of the world who are not community insiders: THIS IS OURS. I’m incredibly thankful, Automattic, for what you do for WordPress and its community in other places. That’s why I am so disappointed.